Is your medical billing & collection cost effective and efficient? With over 15 years of experience in billing and collections services, our highly-trained team of certified billing experts will assist your facility with superior billing, coding and collection capability. Our service provides an individually assigned billing representative that will work on your account to achieve optimal performance and results that will maximize collections and eliminate “write-offs”. Using a top medical billing services company can provide you with ROI (return on investment). Most physicians, clinics, and groups that perform medical billing in-house incur high costs and collect a significantly lower percentage of claims then which they are entitled to . They have to incur the costs of personnel, software, and hardware, which can costs tens thousands of dollars per year, at a minimum. 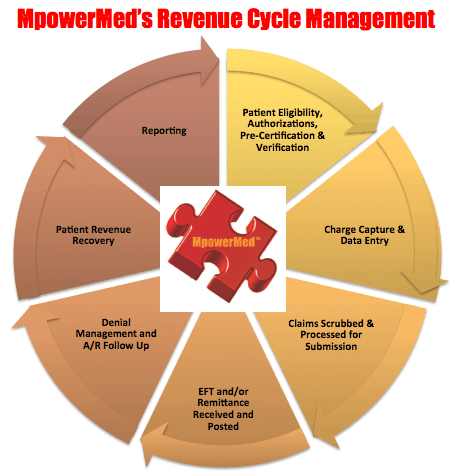 What would your specific ROI be if you used MpowerMed as your medical billings company? Give us a call, and we’ll be happy to run the numbers for you. Track demographics, insurance information and charges. Bill self-pay and third party payers. Perform follow-up/collection of outstanding claims and posting of payments. Track receipts of EFT and Lock Box payment. Establish/maintain charge master file (includes standard gross charges and Medicare fee schedule). Calculate, pro-rate and post third party payer receivables. Maintain/supervise receivables (includes follow-up activity, payments and adjustments). Meet with clients on a monthly basis to review account status and activity. Generate monthly productivity and financial reports. Enroll in ERA and EFT. Send out patient statements on monthly basis. Create and evaluate fee schedules. Track claims directly from clearing house. Record and reconcile insurance and patient payments. Prepare appeals for denials; challenge insurance companies to receive the correct reimbursement. Scan for speedy submission of second claims. Do you want more information about our billing and collection services? Send us a mesage to find out more.